Actor Myles Pollard with enthusiastic workshop participants. STUDENTS from Gilmore and Coodanup colleges were exposed to mad scientists and lobotomies as part of a project to produce horror films. The students worked alongside industry professionals this week in workshops as part of Murdoch University’s Creative Arts Initiative (CAI). The CAI has run for the past three years, offered to high school children in Perth’s southern suburbs. “High school students get to shadow university film students and many take the opportunity to ask them what it’s like to study at university,” CAI project leader Antoinette Geagea said. 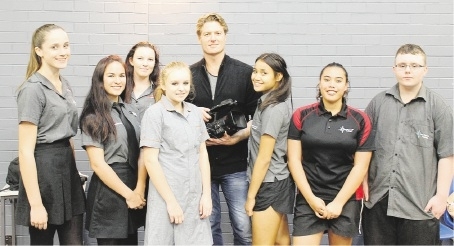 “In 2013, Coondanup College had no students apply to university but in 2014 they had five entries, three of which were from students that were involved in making the film. Producer Brad Major said the premise behind this year’s film was that any student who misbehaved was sent to a mysterious room known as 2.22, where a mad scientist lobotomised students into the perfect teenager. Director and actor Myles Pollard ( McLeod’s Daughters, Drift) said the project exposed students to the work, focus, responsibility and diligence needed to make a film. The project included workshops, auditions and filming. Filming will take place later this month with second and third-year university students mentoring the high school students.